Serie de TV (1971-1973). 98 episodios. "Kamen Rider" es una de las series japonesas más populares del género Tokusatsu. Se trata de un guerrero biónico con aspecto de langosta, que combate el mal a bordo de su motocicleta Cyclone. El mundo está plagado de agentes de Shocker, una organización terrorista cuyo plan es la dominación del mundo. Shocker secuestra a sus víctimas y las transforma en mutantes y les lava el cerebro. 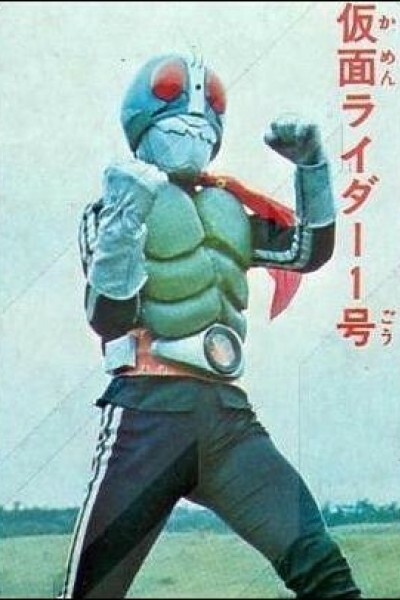 Sin embargo, una de sus víctimas es rescatada, su nombre es Takeshi Hongo y es quien asume la identidad de Kamen Rider Ichigo. Más tarde, Shocker secuestraría a Hayato Ichimonji para transformarlo en un cyborg y derrotar a Kamen Rider Ichigo, pero éste lo rescata, e Ichimonji se convierte en su compañero Kamen Rider Nigo. This is Kamen Rider BLACK!! Kamen Rider Den-O: Sing, Dance, Big Training!! Kamen Rider Backwards-Kiva: Queen of the Castle in the Demon World: Kurenai Wataru's Backwards Face?! Kamen Rider Backwards-Kiva: Queen of the Castle in the Demon World: Castle Doran Backwards Battle?! Kamen Rider Backwards-Kiva: Queen of the Castle in the Demon World: Nago Keisuke's Backwards Face?! Kamen Rider Backwards-Kiva: Queen of the Castle in the Demon World: The Queen Descends! Kamen Rider Drive - Secret Mission Type TV-KUN: Hunter & Monster! Chase the Mystery of the Super Thief! Kamen Rider Drive - Secret Mission Type TOKUJO - Episode 1: How was the TOKUJO Assembled? D-Video Special: Kamen Rider 4 - Episode 1: Deathmatch! The Kamen Rider Died Three Times!! Kamen Rider Drive - Secret Mission Type TOKUJO - Episode 2: Just What is the Anima System? Kamen Rider Drive - Secret Mission Type TOKUJO - Episode 3: Who Killed Professor Odagiri? Kamen Rider Drive - Secret Mission Type TOKUJO - Episode 4: Why Was Professor Banno Targeted during the Global Freeze? Kamen Rider Ghost: Commemoration! Short Stories - Amazing! World's Beginning! Kamen Rider Ghost: Commemoration! Short Stories - Strongest! Another Ghost! Kamen Rider Ghost: Commemoration! Short Stories - Upheaval! 100 Souls! Kamen Rider Ghost: Commemoration! Short Stories - Fate! Two Takeru! Kamen Rider Ghost: Truth! The Secret Of Heroes' Eyecons! Kamen Sentai Gorider - Maze 1: Emu Dies? Kamen Rider Amazons - Episode 17: QUO VADIS? Kamen Rider Murder Mystery! You’re the Great Detective! Dokugander, Confrontation at Osaka Castle! Deadly Poison Monster Mushroommolg's Sortie! My Name is Mysterious Birdman Gilgalass! Monster Poison Lizard, Duel in the Valley of Fear!!! The Bottomless Swamp Monster Earthworm Man! Monster Horseflygomes' Rokkoudai Mountain Pursuit! Three Head of Generator Monster Seadragons!! Monster Newtgeth, Duel at the Farm of Hell!! Hell Ambassador!! The True Meaning of Fear? Gel-Shocker Appears! Kamen Rider's Last Day! Fear's Pet Strategy, Drop Rider into Hell! Hongo Takeshi, Cactus Monster Exposed!? Gel-Shocker Annihilated! The End of the Leader!! Rider Number 3: His Name is V3! Snake-Man With a Machine Gun! Enter, Hammer Jellyfish! V3 Unleash Your Killing Technique!! What is the Destron Hell Squad!? The Claws of Evil Reach Out for V3!! Junko Becomes a Monster's Bride?! Gecko Monster With a Missile On His Back! V3, Beware the Fiendish Traitor! The Five Commandant's All-Out Attack! Doktor G! The True Form of Evil is...? Enter, Baron Fang: Commandant of Curses!! Spectre of Onibi Swamp: Rider Scouts Annihilated!? V3 in Danger! Riders One and Two Return!! Critical Moment! Baron Fang vs. Three Riders!! Terror of the Carnivorous Fauna Plantaingan!! Sudden Death! V3 Mach Kick!! The Snail Man's Human Experiments! Riderman, Where Will You Go? Look! The Face of the Destron Leader!! A Gunshot Rings Out! Kazami Shiro Falls!! You Are Rider Number 4!! GOD, the Shadow of Fear!! The One-Eyed Monster's Human Review Operation! The Japanese Island Fragmentation Plan! The Terrible Genius Human Project! GOD Secret Police! Apollo Geist!! The Invulnerable Water Snake Monster Hydra! Sweep the ESPer Girl Away! GOD's Secret Base! X Rider Sneaks In!! Counterattacking Apollo Geist! X Rider in Danger!! Scary! Humans are Being Made into Books!! Scary! It's GOD's Cat Disguise Operation!! The Corpses at the Ghost Mansion Call!! A Monster!? The Mysterious Snake Man Appears!! Apollo Geist's Last General Attack!! The Terrible Great Giant! King Dark Appears!! King Dark! The Devil's Invention!! Revenge Demon Geronimo! The Silent Attack!! The Mysterious Thief, Rhinocerous Beetle Lupin!! Special Edition, Full Force of Five Riders!! Look! X Rider's Great Transformation!! Deathmatch!! X Rider vs. X Rider!! I Want Blood! The Monster of the Corpse Swamp!! The Weapon of Terror Aims at Three Riders!! Person? Wild Animal? The Cool Guy Who Came From the Jungle! The Strong, Naked, Fast Guy! The Weirdo Who Came From Underground!! The Riddle of the Inca Rope-Pattern Writing!! Melt! Melt! The Terrible Snake Beastman!? The Crocodile Beastman That Attacked the School!! Go, Amazon! To the Island of Crab Beastman! Black Cat Beastman Aiming at the Nursery School! The Golden Snail is the Grim Reaper's Envoy!? Approaching! Ten-Faced Demon! Danger, Amazon!! The Ten-Faced Demon Dies! And a New Enemy? Garanda's Tokyo Sea of Fire Operation!! Fear of Zero! The Massive Earthquake Operation!! Going into Action, The Garanda Juvenile Squad!! Imitation Riders vs. Amazon Rider! You Did It, Amazon!! The End of Great Emperor Zero!! I am the Electric Human Stronger!! The Secret of Stronger and Tackle! The Thriller House Calls for Children!! The Demonic Motorbike Reckless Driving Operation! The Jellyfish Machine Monster Who Took the Form of a Teacher! Don't Melt, Rider! The Final Blow, Electro-Kick!! The Band of Demons Has Come!! The Frightful Gummer Bug! It Targets Humans!! The One-Eyed Titan! The Final Counter Attack!! The Appearance of Enigmatic Chief Executive Shadow! Shadow's Trump That Calls Death!! The Bloodsucking Bubunger's Demonic Present! Ghost Story: The Cursed Old Castle! The Great Scary Desert! Two Toubeis?! Sharkshark Island, Decisive Battle in the Sea! The Devil of the Underground Kingdom!! Bizarre! The Unmanned Train Runs!! Seen!! The Great Leader's True Identity!! Remodelled Majin! The Delzer Army Appears!! The Curse of Majin Kate's Blood! Goodbye, Tackle! Her Last Activity!! Deadly! Super Electro Three-Stage Kick!! Stronger Dies in the Full Moon!? The Snake Woman's Bloodsucking Hell! The Man Who Returned! His Name is V3!! Three Riders Vs. The Powerful Delzer Army! Riders Captured! Long Live Delzer!! Goodbye! The Glorious Seven Riders! What is the Immortal Cockroach Man's G-Monster's True Identity? Two Kamen Riders, Who is Another? Run, X Rider! Hiroshi Tsukuba! Don't Die!! Thank You, Keisuke Jin! Leave the Final Blow to Me!! Danger, Skyrider! He's Come! Kazami Shirou!! Kazami-sensei! I'll Get the Octopus Gang!! Hurry, Ichimonji Hayato! Save the People Caught in Trees!! The Mystery of Nakiri Village! Is Hiroshi also Caught in a Tree? Ghost Story Series - The Werecat Wants Children's Blood! Ghost Story Series - The Snake Woman Curses Tsukuba Hiroshi! Four Skyriders, Who is the Real One? You, Also Enlist in the Command Boys' Squad!? Hiroshi's Father Had Lived! As Altered Human FX777? The End of Admiral Majin! And the Great Leader's True Identity? SOS! Kazuya, Cooperate with Dogma! !